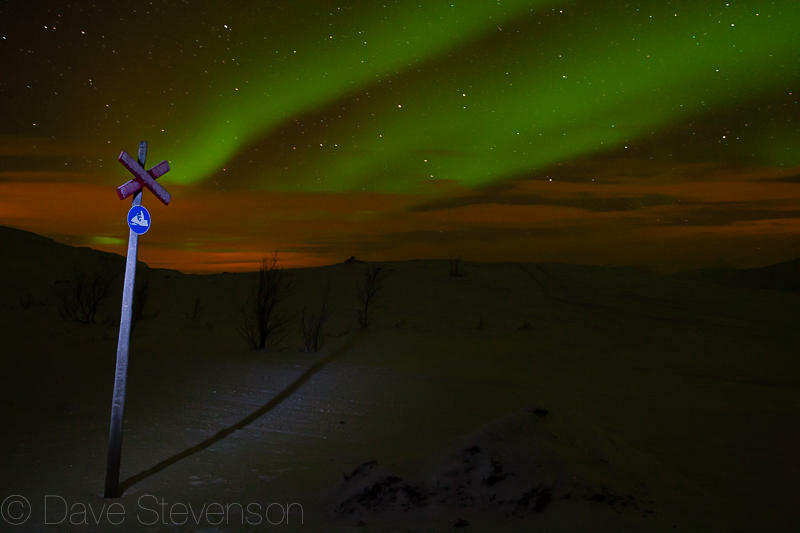 Snowmobile sign under Northern Lights in Abisko National Park, Sweden. 30 seconds at 24mm. f/4, ISO 1600. 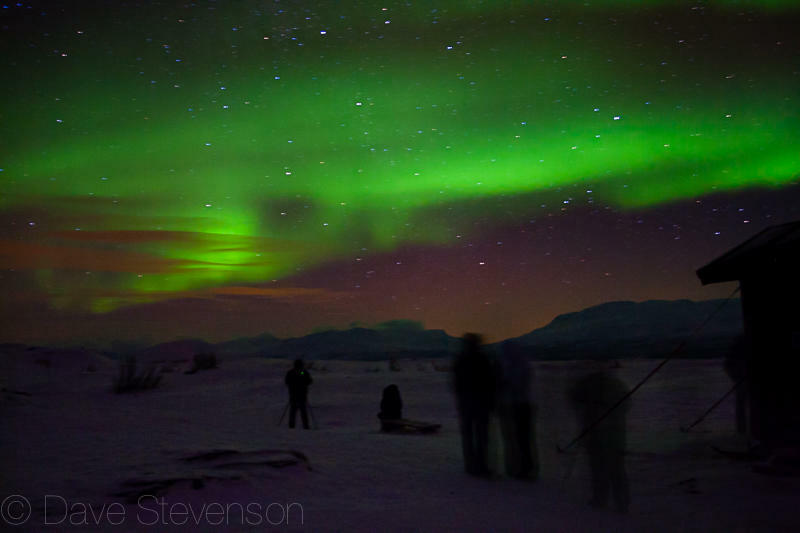 There are two kinds of photographers: those who have photographed the Northern Lights, and those who want to. Here’s my crack at changing camps. You go a long way to photograph the Northern Lights. Expiring air miles and a spare week in February underscored this. 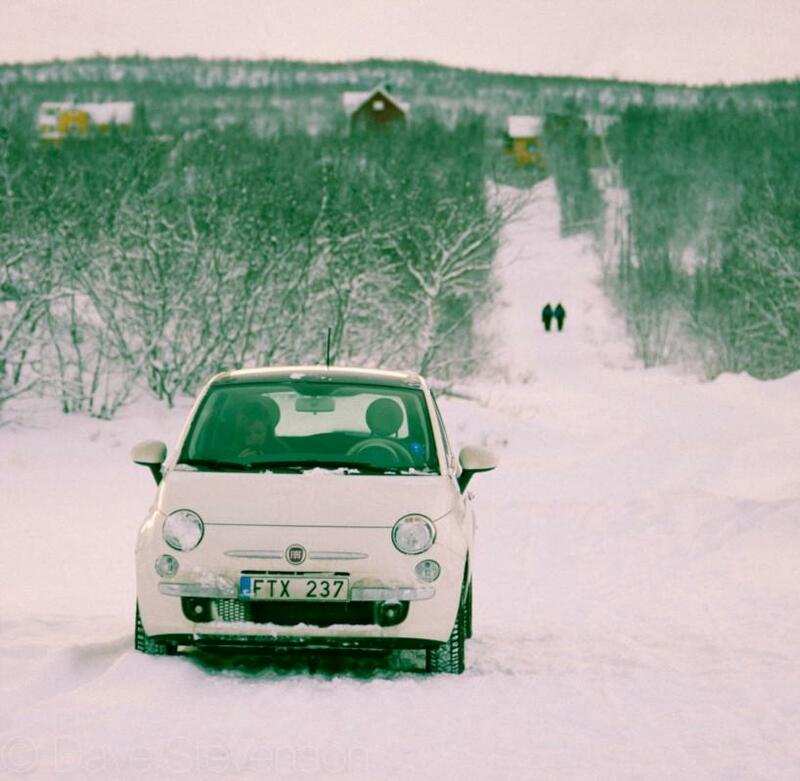 Flying to Stockholm leaves you more than 800 miles south of the Arctic circle - a long way in any car. Even further in snow and ice. Further yet in a Fiat 500. Some of the driving was miles and miles of uneventfulness. Some of it was more exciting (overtaking trucks on snow can be interesting), and some of it was positively enlivening. No danger of dozing off, at least. 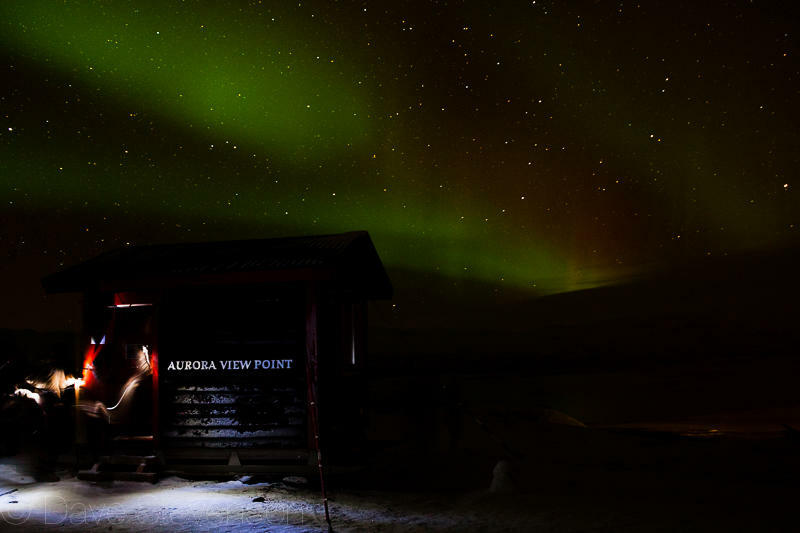 Even once you’re in the Arctic Circle, there is a considerable question over whether you’ll see the Northern Lights at all. 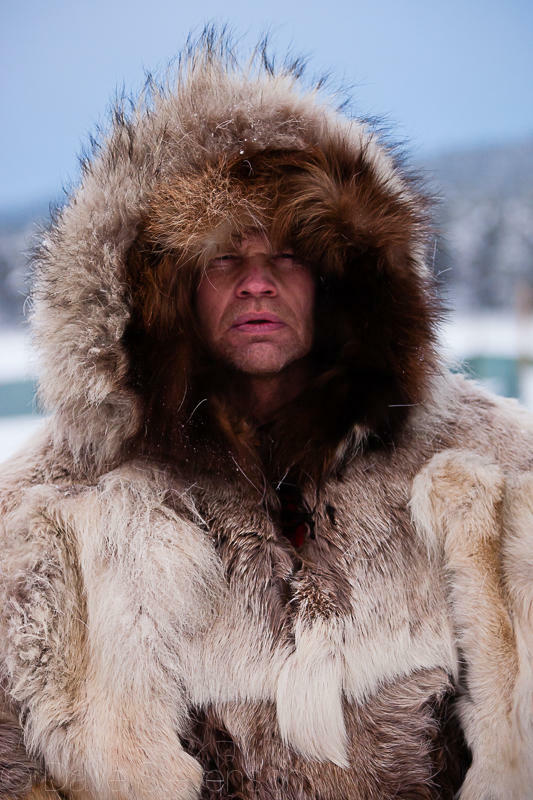 Plenty of people spend plenty of money, and then a week on a side of a mountain in -13° weather. And then after seeing no sign of the Aurora, they eat their fill of reindeer soup and come home again. The odds aren’t really for or against you. If you see nothing, you take it on the chin. But fortune favours the bold. The first night the Northern Lights were visible while I was still under street lights, and the higher I climbed, the stronger they got. In Abisko there is a viewing point at the top of the hills behind the Björkliden Hotel. It’s all very civilised: big windows, reindeer skin rugs on the floor, electric heating. A warm and cosy place to watch for the Aurora. Blink and you’ll miss a far more promising photograph a few hundred metres down the slope - namely, this highly appealing piece of Scandinavian architecture. I think they call it a “barn”. 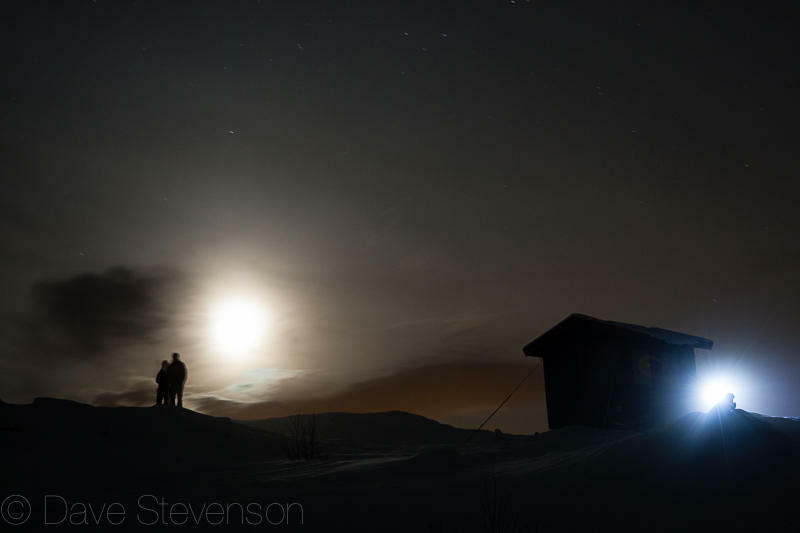 Illuminated structure under Northern Lights, Abisko National Park, Sweden. 30 seconds at 24mm. f/4, ISO 1600. Manual lighting. 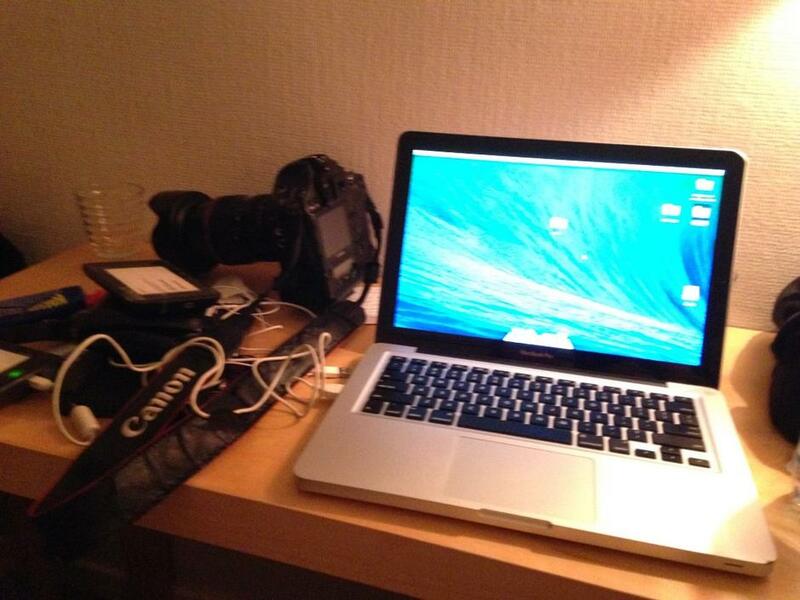 On most DSLRs without remote triggers the longest shutter speed you can get is 30 seconds. At this exposure you’ll need the biggest aperture available (f/4 on my 24-105mm) and a decent thwack of ISO, 1600 in this case. You’ll be wanting a tripod, the upside to which is that it doesn’t need to be an especially good one since you can dig the legs into the snow a bit for added stability. The real challenge is finding a way to make your Northern Lights pictures interesting. Any idiot can aim a camera at the sky, autofocus on infinity and plug away for thirty seconds at a time. 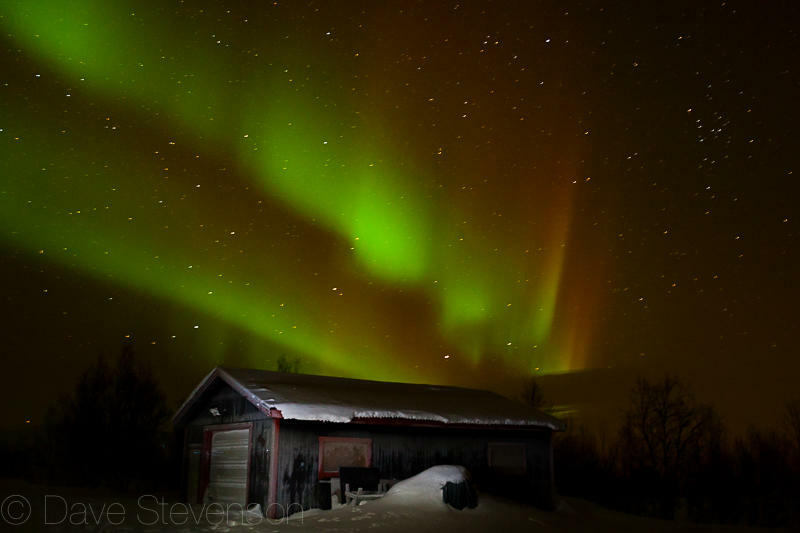 On some nights the Aurora puts on fireworks-style displays. On others it’s a more subtle affair. You’ll never be more aware of needing to make every exposure count: the lights don’t stay on forever, after all. 1. Find something in the foreground. Buildings are best, really, as they don’t get impatient or cold and they don't fall over. 2. Figure out how far away the building is - you’ll need to know this so you can set the focus on your lens. Autofocus doesn’t work very well in the dark. At this point those with lenses with distance markings on the barrel will be feeling particularly smug. 3. Frame up. Plenty of sky, don’t forget. Bonus points for ultra-wide angles. When I go back I’ll take something <20mm. 4. Camera shake is the enemy. If your camera has a 2-second timer, use it to avoid jiggling the tripod. 5. Press the shutter, wait for the camera to trip, then paint your chosen building/person with light. How much light, from which direction and for how long depends (thank goodness for digital, eh?). Obviously for preference you’d use a few wireless flashguns instead, which will give you fewer colour balance problems later. One to add to the “learning curve” category. Not much is heavier than an un-back-upped camera full of pictures. Not much room in the hotel room either, but enough space for a computer and three hard disks. Of course, if you stuff up the Aurora, or more likely it doesn’t come out to play, there’s plenty of other stuff to shoot. Ptarmigan have been all the rage of late for some reason and Sweden is a great place to go and shoot these pretty, rather dim little characters. 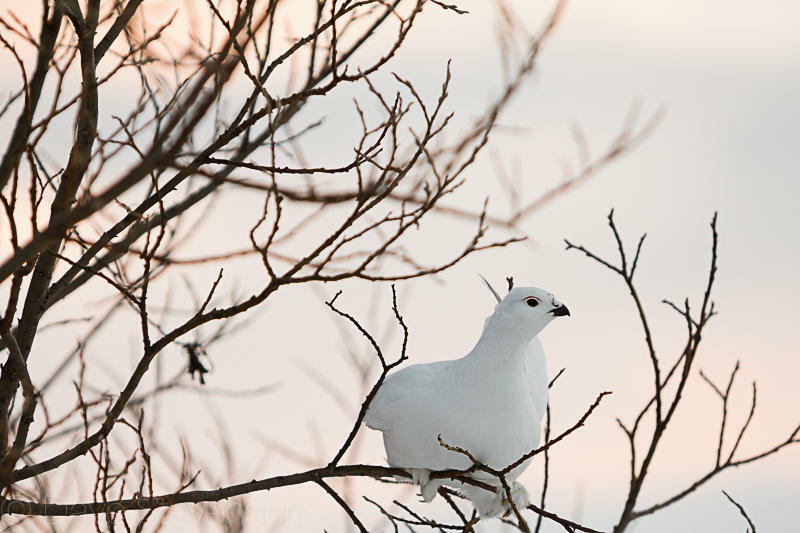 ABISKO, SWEDEN Ptarmigan in snow. 1/250th at 200mm. f/3.5, ISO 800. 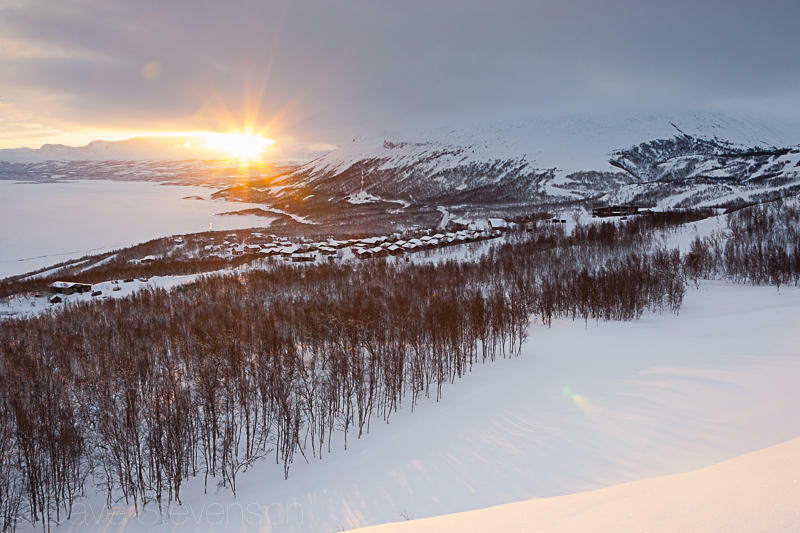 ABISKO, SWEDEN Sunrise over Abisko National Park. 1/100th at 24mm. f/9, ISO 500. And the locals are pretty appealing to boot. 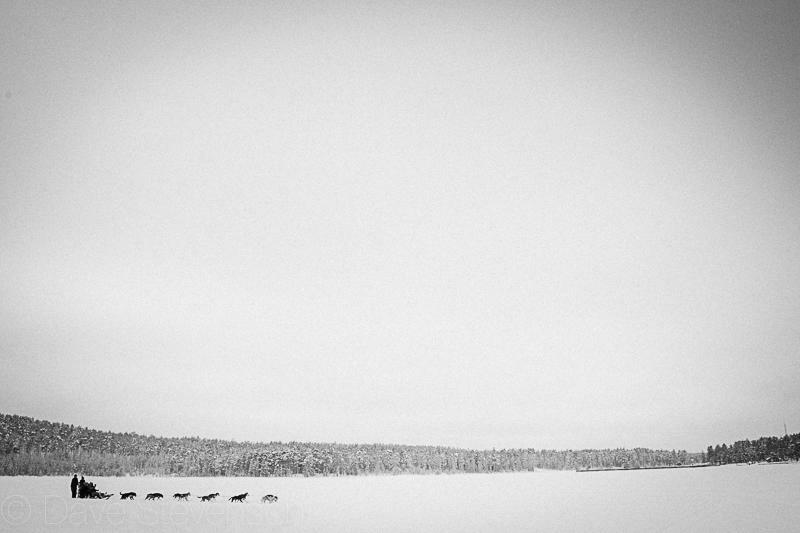 JOKKMOKK, SWEDEN Dog sledders cross Lake Talvatis during the annual Jokkmokk Winter Market. 1/100th at 24mm. f/6.3, ISO 640. Even if some of the local sports are… esoteric. 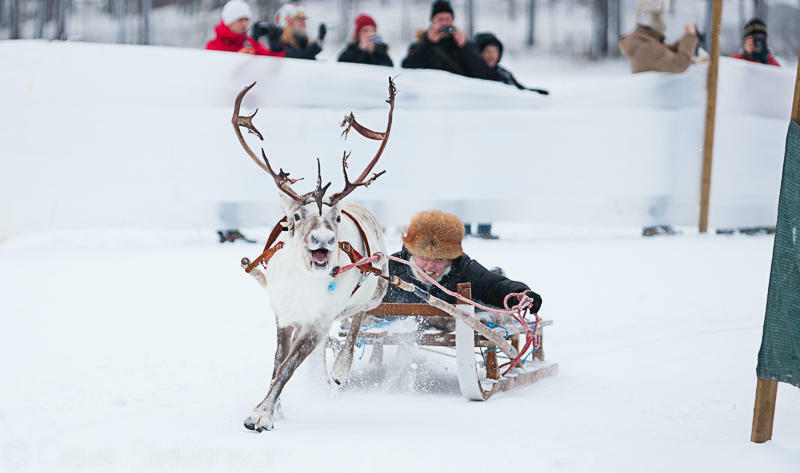 JOKKMOKK, SWEDEN Reindeer racing at the annual Jokkmokk Winter Market. 1/1000th at 170mm. f/2.8, ISO 1250. Good rule of photography: if in doubt, get as far through/around/under/over the nearest safety fence as you can without getting told off or trampled by a deer. JOKKMOKK, SWEDEN Traditionally dressed reindeer racer at the annual Jokkmokk Winter Market. 1/1000th at 73mm. f/2.8, ISO 1250. You could always just keep your eyes peeled. The local fashions are as eye-catching as they are cosy. I assume, anyway. While it looked like there was room for two in this chap’s outstanding reindeer onesie I didn’t put it to the test.